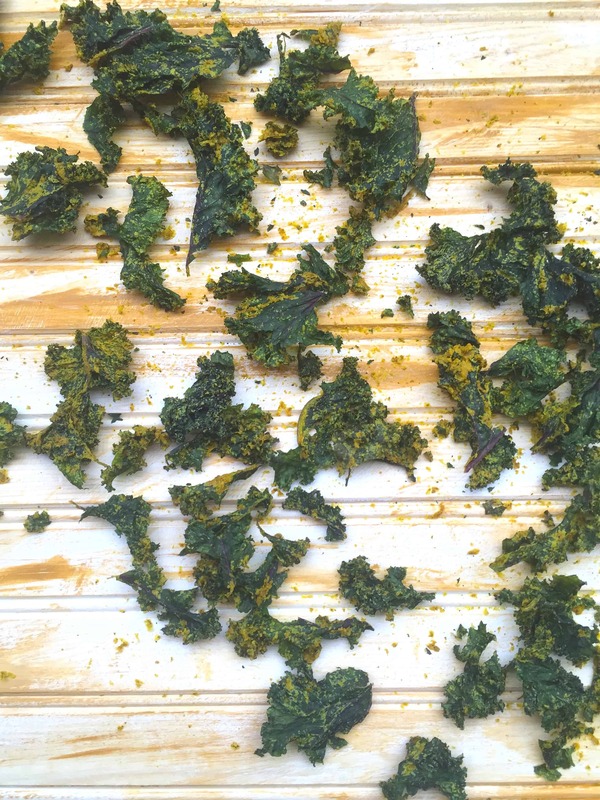 Spicy and full of flavor from tahini, garam masala, and turmeric, these curried kale chips are a delicious healthy snack or crunchy topping for soups and rice bowls. I used my new dehydrator for this recipe but also provide oven instructions in the recipe notes! I’ll admit, I’ve been a little obsessed with my dehydrator ever since I brought it home from the store a couple weeks ago. With tailgating season upon us, it was the perfect time of year to add it to my arsenal of kitchen tools. Kale is crunchy, pairs well with a number of spices, and is relatively quick to dehydrate. It’s also rich in vitamins K, A, and C and also contains tons of healthy fiber. Phytonutrients in this cruciferous vegetable have been shown to have anti-inflammatory and antioxidant properties, support our natural detoxification system, and decrease risk for a number of specific cancers (including breast, prostate, colon, and ovarian) (1). I then whisked together the sauce in a separate bowl. I decided to give my kale chips some Indian flavor with garam masala and turmeric but you could use a number of different herbs and spices. I like my kale chips with a bit of a kick so I added 1/4 teaspoon of cayenne pepper but feel free to omit (or add more!) based on your taste preferences. 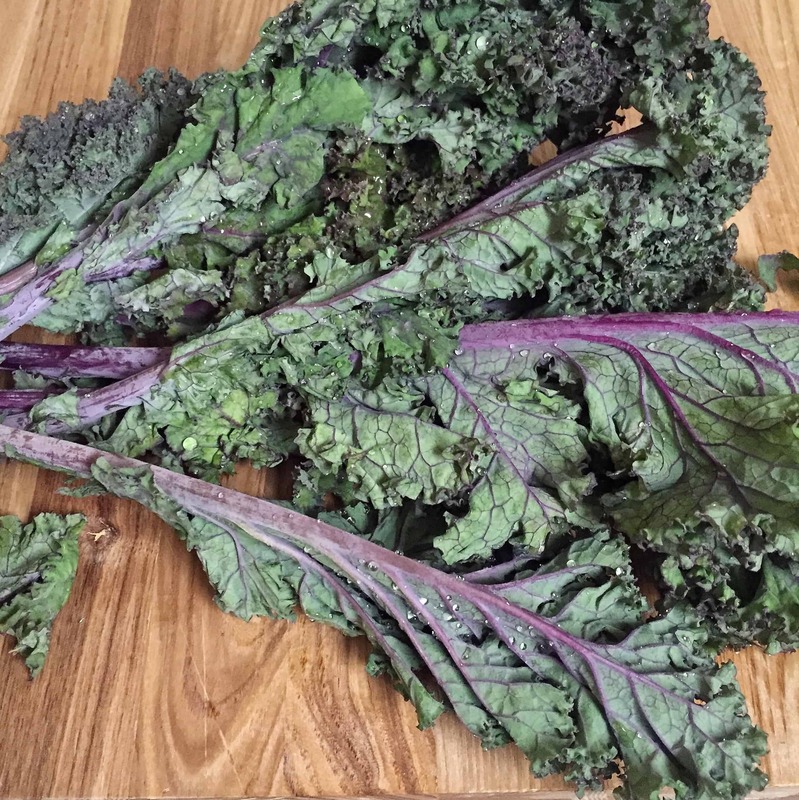 Once the sauce ingredients are mixed together, add it to the kale and mix until all of the kale leaves are coated. I found that using my hands was the easiest and quickest way to do this – just be sure to wash them immediately afterward because turmeric will stain anything and everything bright yellow! I then spread the chips on my dehydrator trays and dehydrated on medium for about 3 hours. Chips should be completely dry and nice and crunchy once they’re finished. These guys are definitely coming with me to my next tailgating party. (Come to think of it, they really are the perfect green and gold snack!) As a bonus, they’re also super tasty on top of salads, soups, and what I like to call “one-bowl-wonders” (aka Buddha/macro bowls). 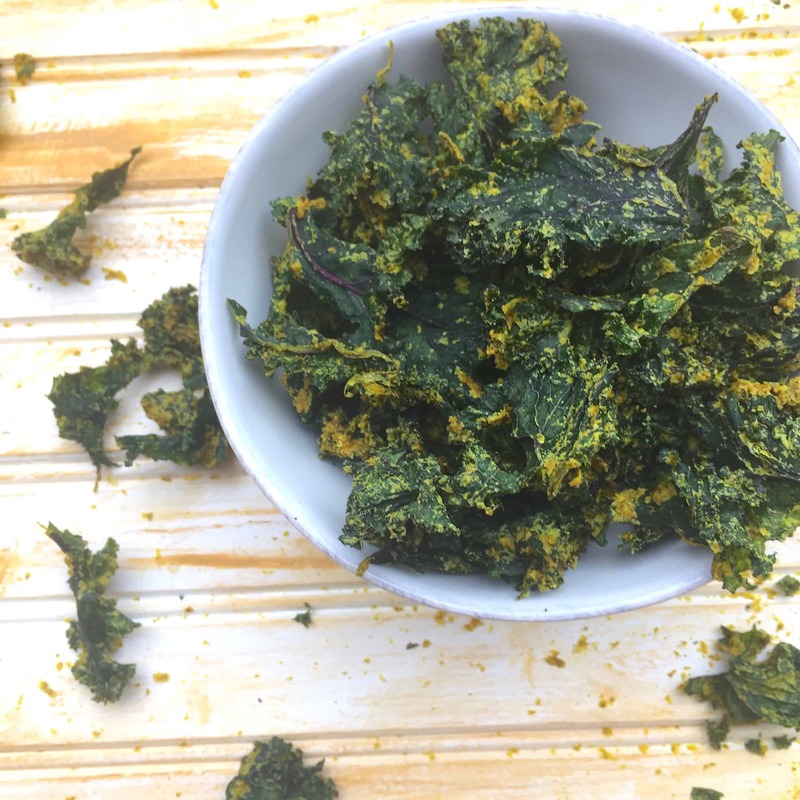 Spicy and full of flavor from tahini, garam masala, and turmeric, these curried kale chips are a delicious healthy snack or crunchy topping for soups and rice bowls. Power on dehydrator or preheat oven to 250º F or lowest possible heat. 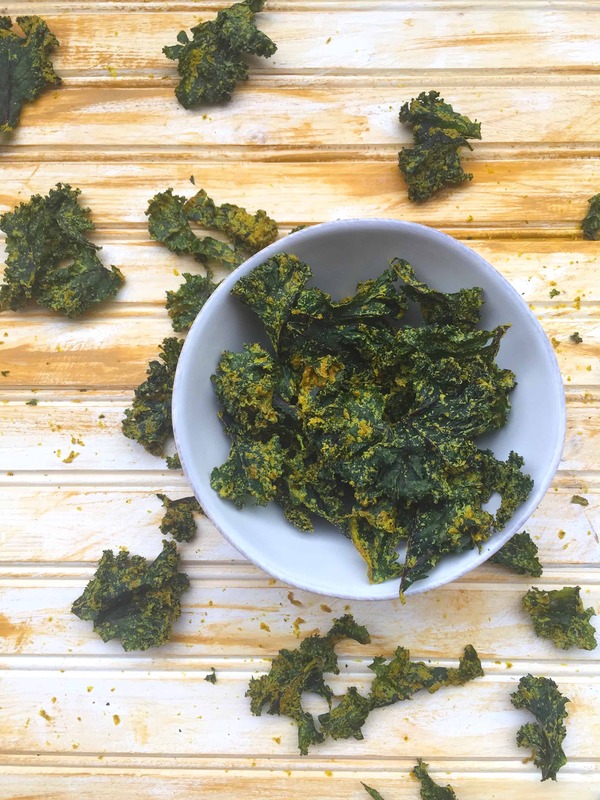 Combine ingredients in a large mixing bowl and then spread kale pieces on dehydrator trays or lined baking sheets. Dehydrate (or bake in oven) for 2-3 hours or until crispy. Enjoy immediately or store in an airtight container for up to a week. Do you have a dehydrator? What’s your favorite thing to make in it? The tahini is where it’s at!!! These are beautiful! 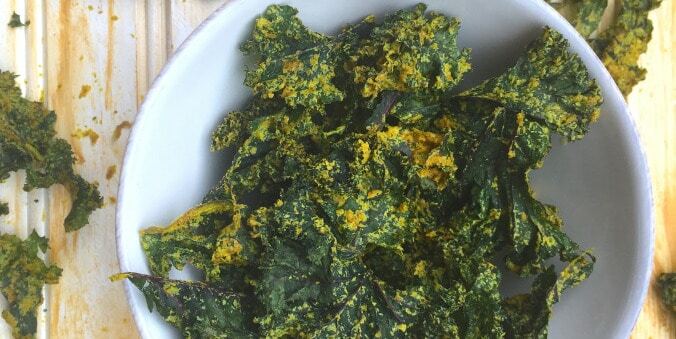 I’ve never added tahini to kale chips, but now I will!